Let’s see if I still remember how to do this (blog). I’ve sort of decided what good does it do, this blogging stuff? I suppose most people reading my blog are of like mind, so I’m only preaching to the choir. But more importantly, I’ve realized that sitting at the computer for hours at a time (yes, it takes quite awhile to put out a decent post unless I’m just blowing smoke), is not good for my body. I’ve got aching body parts and sitting too long is not good. From Trevor Laudon: Message from Hell -An Interview of Former Black Panther (friends of the head of our Unjustice Dept). 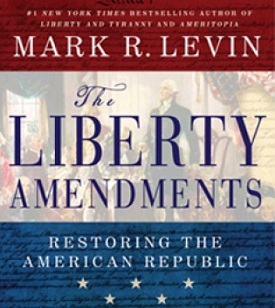 Mark Levin’s Liberty Amendments will give you hope that there is a solution. Have a look and get the book! This is a grassroots, from the bottom up method of restoring the greatness to America (as opposed to what is crammed down our throats by those in Washington DC) . Pass this around and around and get the book: The Liberty Amendments: Restoring the American Republic. For more information on how this can be accomplished and a daily dose of optimism you’ll want to bookmark Levin’s FREE daily podcast too! The incredulity expressed as more and more people disengage from the system, from voting or even caring is nothing more than denial. And why are so many people turned off to the most wonderful thing we have as a free people -Liberty? Because it’s been hijacked by a simple but pervasive disregard for the rule of law. The GOP here is intent on keeping party control at the top, trying to marginalize the Ron Paul & Tea Party delegates. The vote conducted by Speaker Boehner requires a two-thirds majority to carry. Here’s how that played out. ” The Ayes have it” -are you kidding? Where was this Russia or China? The DEMs had a schizophrenic moment wanting to walk-back their controversial removal of GOD and Jerusalem as the capital of Israel, from their party platform, but they had an even harder time making democracy work. It took old Anthony Villaraigosa three floor voice votes to channel his dictator self. Pretty amusing if it weren’t so sad. And why do you supposed that “Arab American” lady down in front looked so disappointed? Springtime came much quicker in Egypt but it’s gonna take the Islamists a little more time to get rid of us Christians perhaps. This is why we cannot disengage. They will not stop! America is too good to let Government do it! It seems like I am cheaping out on a blog post today, taking the easy way out, but this needs more play so I hope you’ll watch it, think about it and PASS IT ON! Don’t give up on these ideas of liberty, limited government, individual responsibility, fiscal accountability and equality of opportunity! Keep pushing and pushing until we take the country back. That’s my Tip of the Day!